Everytime Sabrina looks up from her laptop, she sees Chairman Mao smiling with a face of approval. In the picture Mao wears a crisp grey button up, and has his hair smoothed back. Something about this man and what he represents has always fascinated Sabrina. 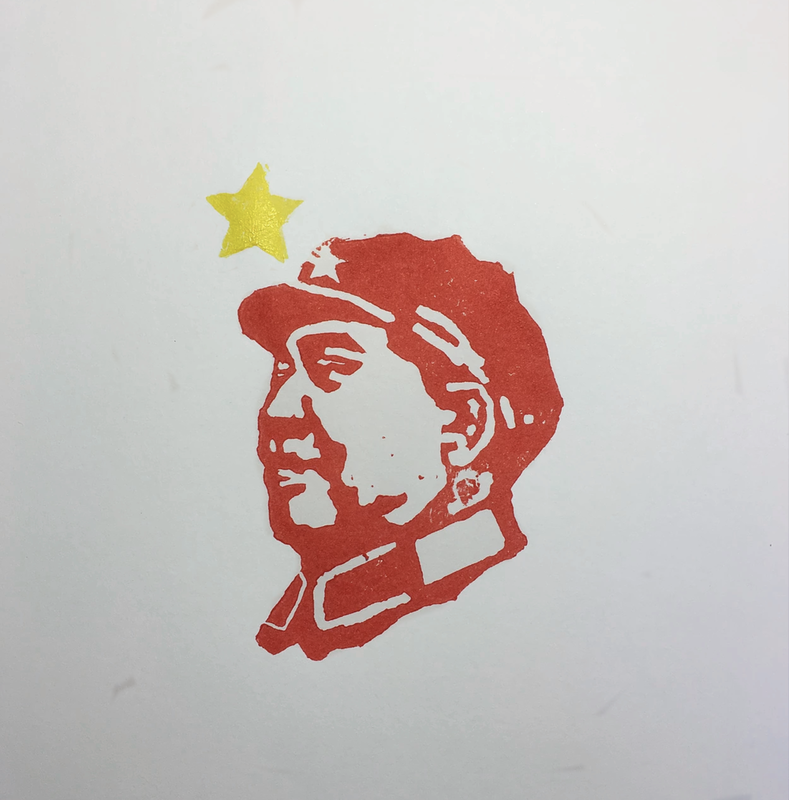 Is Chairman Mao the red sun in the hearts of people around the world, the pride and joy of all revolutionaries? Or is he Chairman Mao, mass murderer, and oppressor of all western ideals? Mao Ze Dong complicates history. By reforming the ownership of land, he helped close the social and economic disparity in China. Consequently, his methods killed millions. Without him, China might never have been able to become the superpower it is today; yet, because of his Great Leap Forward, Mao sowed famine, death, and ecological disaster. Western culture taught Sabrina that Mao is pure evil, someone who poorly executed incredulous ideas and had no concern for the lives of the people. However, Sabrina also sees someone who her parents believe helped revolutionize China and brought it to where it is today, someone who positively benefited their country and who was strong enough to make sacrifices for the greater good. When Sabrina looks at Mao, she isn’t looking for the good or bad, but is looking for the truth--and the truth is he is both and is neither. Like everything else in the world, Mao is multifaceted. Few things are black and white; complexity is the nature of things. From American politics, artificial intelligence, or the current state of political tension in Hong Kong, an ability to see the problem from all sides is important. Sabrina wants to seek the truth: no matter how ugly it may be. Being willing to challenge ideas and being unafraid of exploring controversy allows Sabrina to approach understanding from all angles. In a society where everything is expected to have a definitive answer, being able to rise above and consider all aspects of right and wrong, good and bad, is what makes Sabrina an asset to society. Throughout 2018, Sabrina worked on her project of making and selling t-shirts for her senior project. As her project developed, it shifted from being more of a business and focusing on the business aspect of it to focusing on the art aspect and learning about creating instead of selling merchandise. A part of this is because she realized that if she was just making things for other people that she didn’t want to make, it would be hard for her to stay on task and keep going with the project. Another part of this is because she realized she wouldn’t be able to really be profitable. Materials were extremely difficult to locate and were expensive, and she also had to get blank t-shirts shipped to Hong Kong from the United States because she couldn’t find them at a good price locally. Sabrina’s peers were unwilling to pay more than $120, and even then a lot of the times she never got paid fully. The time it took to make the shirt and the work she had to put in combined with the cost of materials meant that she would never really be making money, and would’ve still lost money even after selling the shirts. This was the biggest challenge Sabrina faced and one that had the greatest impact on her project. Other challenges she faced were smaller, such as finding time to make shirts and locating materials. Sabrina spent a long time trying to find inks and blocks to create her shirts with because there aren’t many art supply stores in Hong Kong. The ones that do exist mark prices up really high, but eventually she found a website that had decent prices. Because the site wasn’t reliable, it took a lot of communication and a long time to actually receive her supplies. Finding blank shirts was hard as well, and Sabrina eventually had to order it off a wholesale website in the US and then shipped to Hong Kong, which was quite costly. Overall, Sabrina is pleased with the amount she’s learned about the art of block printing and is really glad she had the experience to explore this topic This project in a way forced her to spend time on art, which is something she enjoys but hardly ever makes time for. She also feels this project has helped her a lot with time management and planning and working on long term projects, which is something she tend to struggle with. Sabrina came into this project with minimal knowledge of block printing and embroidery, but now she feels like she is pretty good at block printing and decent at embroidery. She learned a lot about these topics from blog posts and forums on the internet, as well as instructional videos and social media accounts like rarepress, but most of her learning was done through trial and error. Just by experimenting with a bunch of different methods, she learned about what works best and what looks good and what doesn’t. This whole process has actually been a lot more rewarding than Sabrina had ever anticipated. It started out as something she did because she had to choose a senior project, but as it progressed, she learned a lot about myself, her learning habits, and discovered a passion that she never thought she’d get herself into.